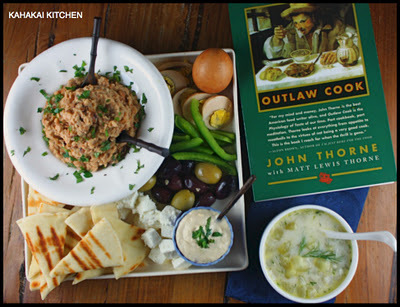 Thanks to everyone who grabbed hold of our latest Cook the Books selection,Outlaw Cook by John and Matt Lewis Thorne, and submitted such great posts for our roundup. We certainly covered a lot of culinary terrain in our posts. And the winner of this Cook the Books round is……………….Claudia of Honey from Rock. Claudia’s now a three-time winner of our little CTB contest and her post about backyard bread baking, Romanesco cauliflower and Lasagna Cacciatora is interesting indeed. Congratulations Claudia! I will now pass the CTB torch to another Hawaiian buddy, my friend and co-host, Deb ofKahakai Kitchen. She will be here soon to officially kick off our next book round, featuring that toothsome children’s classic, Charlie and the Chocolate Factory by Roald Dahl and I’m sure I’m not alone in looking forward to rereading this scrummy book. 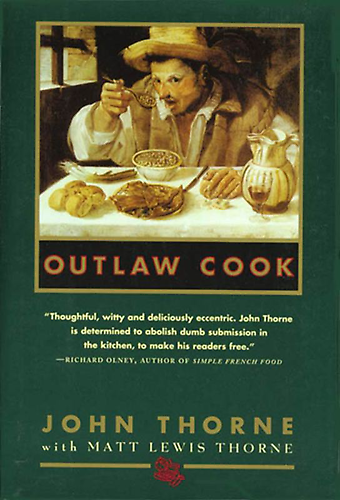 Our December/January book selection here at Cook the Books was John and Matt Lewis Thorne’s collection of essays, Outlaw Cook, a book your host has found very good reading indeed and was delighted to share with this merry band of blogging cooks. Though some of our regular book club participants found their holiday schedules were too crammed for reading (the horror!) 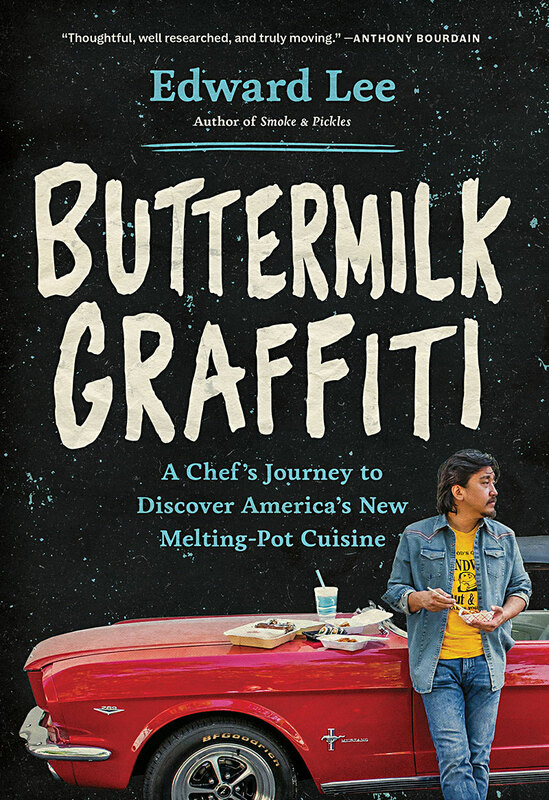 and others found the book difficult to obtain in time for our deadline, an intrepid posse of outlaw cooks wrote up reviews of various chapters in the book and I think they were all marvelous. 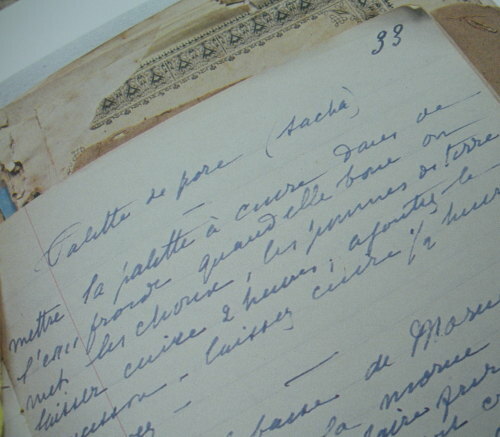 First up is a new Cook the Books entrant, Julie of Cookbook Fetish, who was taken with Thorne’s review of artist Claude Monet’s cooking journals. She enjoyed our featured authors’ “bubbling loquaciousness” and delved further into research about Monet’s culinary interests and Belle Epoque continental cuisine. She was inspired to cook up a Chicken Chasseur. As she notes, “the recipe turned out wonderful, meat sliding from the bone slathered in a buttery mushroomy tomato sauce.” Welcome to Cook the Books, Julie! Next we have Eliot’s Eats thoughtful post about various components of the Thorne food philosophy, (“one couldn’t have too many recipes”, and that cooking and experimenting with recipes is a way of enriching one’s life more so than the finished product). 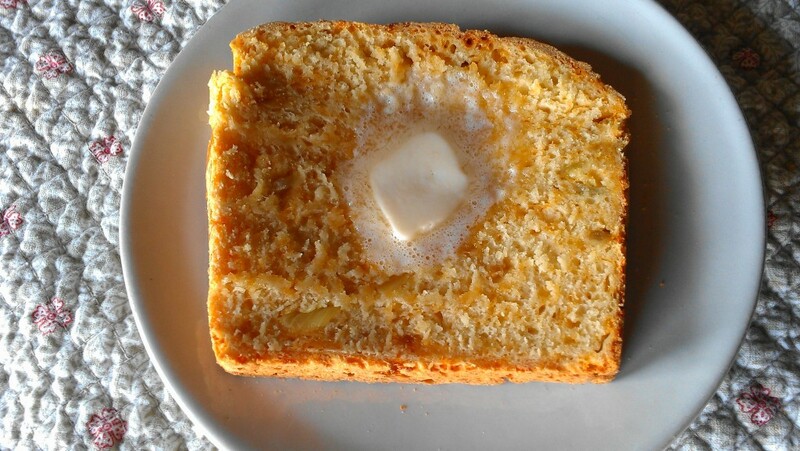 She particularly enjoyed the essay about the traditional English plowman’s lunch and incorporated three of the main ingredients, brew, onion, and cheese into a quick bread. As the English would say, Brilliant! As an avid garlic eater and gardener, Rachel, The Crispy Cook, was taken with the chapter on exploration varieties of garlic soup. 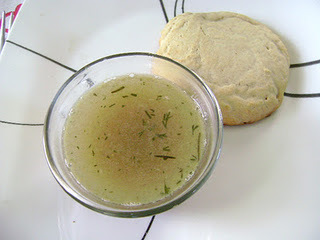 I made an herb-infused garlic broth that was wonderfully restorative after a day out shoveling and battling the winter elements. 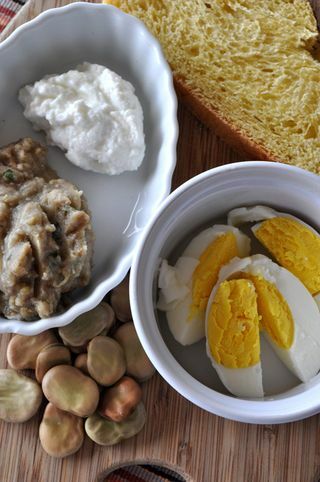 Simona of Briciole, enjoyed ruminating over the Outlaw Cook chapter on Ful Medames, the popular Egyptian fava bean dish. She made use of some lovely-looking locally grown dried favas and mixed them with green lentils, olive oil, and plenty of aromatics to create a great variation on this traditional recipe. An Egyptian Plowman’s Lunch below? My fellow Cook the Books founder and co-host, Deb, of Kahakai Kitchen, enjoyed discovering Thorne’s writing and described our featured book as one “to be savored, tucked into before bed, or revisited when a spark of inspiration is needed.” She was sparked up to whip up some Ful Medames, paired with a Cucumber, Lemon and Dill soup from the Outlaw Cook chapter “Soup without Stock”. Our other CTB cofounder and cohost, Johanna of the Athens, Greece-based blog Food Junkie, Not Junk Food, enjoyed our featured book and was in agreement that “we should not be enslaved by recipes or food writers, but try to find our own voice in cooking”. 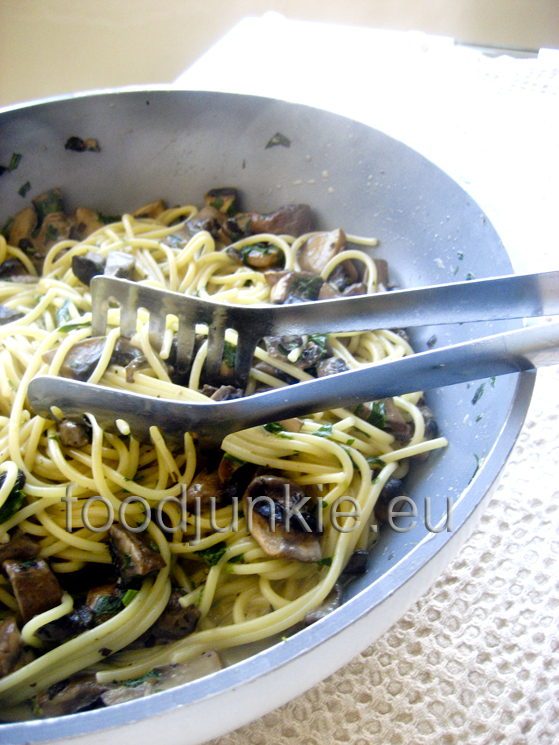 Johanna riffed away in the kitchen and produced a portabella mushroom pasta that was a tremendous hit with her husband. I would concur. Our final submission is from Honey from Rock, Claudia’s Hawaiian blog. She enjoyed the book and notes that “There is so much here to inspire, encourage and challenge all of us who love to cook and to eat good food”. She loved the chapters on breadbaking, (be sure to check out a photo of her gorgeous outdoor bread oven back at her post), but ultimately settled on the chapter about Italian cooking before the tomato was introduced from the New World, entitled “Acetaria”. 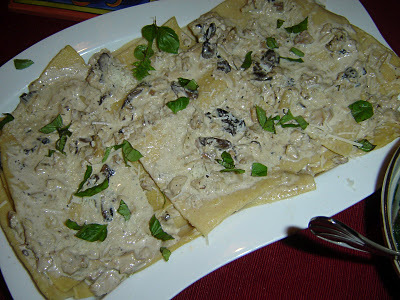 Thus inspired, Claudia made a sumptuous looking pan of Lasagna Cacciatora. What a wonderful banquet of posts! I am sure that our guest judge, John Thorne, will enjoy reading our comments about the book and be interested to see what we all did as outlaws in our own kitchens. I’ll be back soon to announce the winner of this round of Cook the Books after Mr. Thorne gets back to me, but in the meantime you can all hunt down copies of Roald Dahl’s classic book, Charlie and the Chocolate Factory to get your juices flowing for the next installment in our book club reading. That’s how I experienced learning how to cook. I had read a lot of cookbooks and jotted down a bunch of recipes when I was a teenager, but didn’t really translate all that theoretical knowledge into reliably delicious, or even edible, meals until I had to cook my own meals as a young adult. Such thoughtful prose has really made this book such a pleasure for me and I have been waiting to share this new-found favorite author with you all. I’m looking forward to your posts and I’m sure our Guest Judge, John Thorne, will be too. Do you have any favorite passages from this book?